The Idenburg Lake Is Just Steps Away..! Heavy snow restricts us from being able to move freely. Moreover, we must be careful not to step and fall in between sharp stones covered with snow. Slowly, we slip through the gap down the steep ridge. “The lake is in sight ..!”, one of the trip member at the front yells. Yes, that is the Idenburg lake, our destination of this trip. 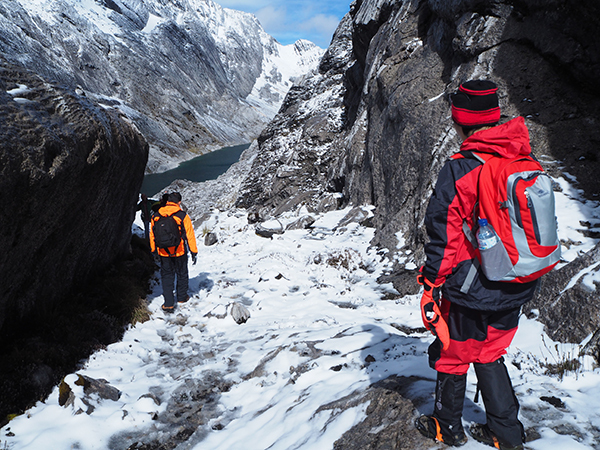 Located at a steep valley on the side slopes of the snow-covered Ngga Pilimsit peak, the beauty of the lake and its surrounding scene made all of our effort trekking down the snowy slopes of Sudirman range since dawn paid off..